The Tretyakov Gallery offers something for art-lovers, history fans and those fond of Russian culture alike. Visitors can easily become lost both in the large museum and in the collection of masterpieces of dedicated Russian artists. It is difficult to remain unmoved after looking at Vasily Vereshchagin’s horrifying masterpiece, “Apotheosis of War.” The oil and canvas work, which stands at 50x77 inches and is probably Vereshchagin’s most famous painting, dates back to 1871. This was a time when the Russian Empire was in complete expansion mode, on its way to stretching from Scandinavia in the west to the Pacific Ocean in the east, and right through to the gates of India in the south. The State Tretyakov Gallery in Moscow shows Russian history in a way that no textbook possibly could. The piece entitled “Triumphing,” another gigantic artwork that measures 77x101 inches, shows a blue-tiled mosque in what is now Uzbekistan. The artist made his way to India, and his paintings of the country pre-date those of the Roerich family. Viktor Vaznetsov’s “The Bogatyrs” is another enormous painting (116x175 inches), on which the three huge knights on their healthy horses are even more magnified. Given Russia’s violent history and troubled past, quite a few Russian artists depicted war scenes in their works. Still, the gallery has several paintings depicting life in Czarist Russia – from portraits of the elite to scenes of pilgrimages and the peace of the countryside. In 1862, Vasily Pukirev painted “Marriage of Unequals,” depicting a wedding of a man in his 60s to a woman who does not look to be even half her groom’s age. The wedding is set in an Orthodox church and looks to be that of a man belonging to the elite of the time. Pukirev was well ahead of his generation when it came to his views on women’s rights and societal lust for money. Other artists, like Illarion Pryanishnikov, show us life during the 1860s, both in the countryside and in cities. It is possible to admire Dostoyevsky’s much-written-about, humble peasant in Pryanishnikov’s “Unladen,” which shows a middle-aged man trying to stay warm in a sleigh on a cold winter evening. The gallery also has a fine collection of portraits: Vasily Perov painted two of Russia’s greatest writers – Alexander Ostrovsky and Fyodor Dostoyevsky – while Ivan Kramskoy’s portfolio included Lev Tolstoy, Pavel Tretyakov himself and the artist Ivan Shishkin, whose work also prominently features in the museum. Some of the sharpest images, which almost look like photographs, were painted by another great 19th century artist – Ilya Repin. The furious eyes of Princess Sophia Alekseyevna greet the visitor into the hall featuring Repin’s work. The artist paints an angry princess, a year after her imprisonment in the Novodevichy monastery during the execution of the Streltsy in 1698. In another masterpiece, Repin shows the horrified eyes of Nicholai Mirlikiyskiy as he saves three innocent men who were sentenced to death. Repin also painted portraits, including those of Lev Tolstoy and the composer Alexander Glazunov. Yet Repin is better known for his grandiose images of real life events such as the “Procession in the Kursk Province,” which is believed to have been painted in 1891. Another iconic painting at the Tretyakov gallery is Mikhail Vrubel’s “Demon.” The image of the dark and handsome demon has always drawn mixed responses from visitors. The most interesting take that this writer has ever heard on the painting is from a Russian art professor now based in Italy. She says that the demon looks sad, since he has the all the weight and burden of the Earth on his shoulders. 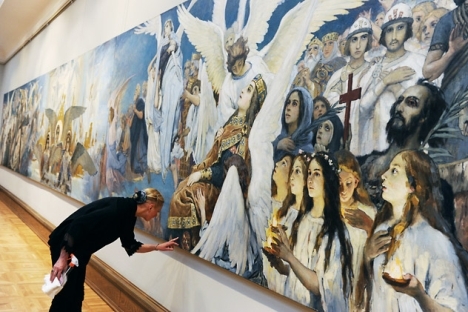 Vrubel’s works have been classified as part of Russia’s Symbolist movement, but the artist himself made a point of staying aloof from contemporary art trends and making his works stand out at the gallery. All of Russia’s great artists and writers have paid special tribute to the country’s glorious seasons and spectacular nature. Isaak Levitan’s “Golden Autumn” captures the beauty of the Russian fall, where the dominant color of the foliage is golden yellow rather than red, as it is in North America. The gallery also houses other masterpieces created by Levitan, who was known for his “mood landscapes.” These include “Evening, Golden Plyos,” which was painted from atop a hill on a summer evening and shows a white Orthodox church by the riverside. Few works of art capture the essence, spirituality and simplicity of summer life in rural Russia in the late 19th century as this work of Levitan does. The State Tretyakov Gallery’s history can be traced back to 1856, when Moscow merchant Pavel Mikhailovich Tretyakov bought works by Russian artists of his day with the aim of creating a collection that could one day grow into a national art museum. In 1892, Tretyakov gifted his collection of about 2,000 works to the Russian nation.